H. Rick Bamman - hbamman@shawmedia.com Johnsburg's quarterback Riley Buchanan cuts left for a first down in the first quarter against Woodstock North Friday, Sept. 30, 2016. 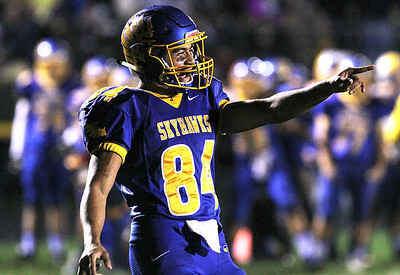 Johnsburg shut out Woodstock North 56-0 . 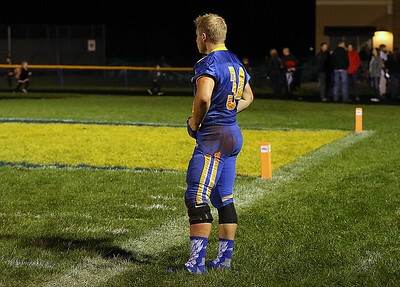 H. Rick Bamman - hbamman@shawmedia.com Johnsburg senior Bryce Smith watches teammates warm up after half time on Friday, Sept. 30, 2016. Smith pulled himself from the game with an ACL injury and is done for the season. 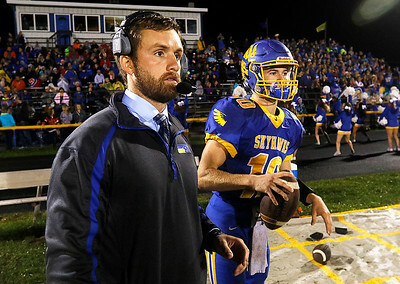 H. Rick Bamman - hbamman@shawmedia.com Johnsburg head coach Dan DeBoeuf and quarter back Riley Buchanan watch the defense stop Woodstock North in the third quarter Friday, Sept. 30, 2016. 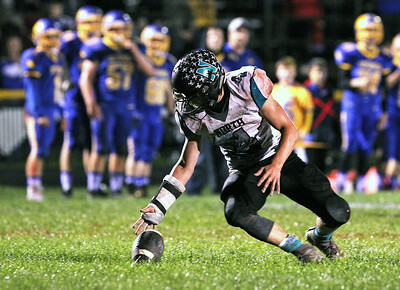 H. Rick Bamman - hbamman@shawmedia.com Woodstock North's Casey Dycas drops the kick off in the first quarter against Johnsburg Friday, Sept. 30, 2016. 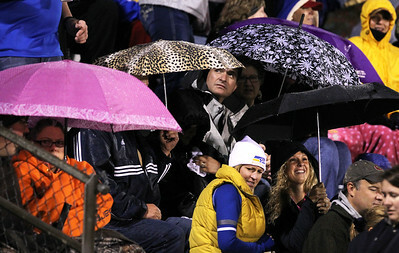 H. Rick Bamman - hbamman@shawmedia.com Johnsburg fans huddle under umbrellas during the first quarter of the game against Woodstock North Friday, Sept. 30, 2016. H. Rick Bamman - hbamman@shawmedia.com Woodstock North's Jacob Glaves is caught by Johnsburg defenders Brandon Ackman (left) and Joe Calhoun in the third quarter Friday, Sept. 30, 2016. 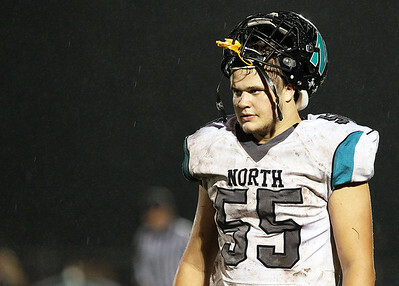 Woodstock North lost to Johnsburg 56-0. H. Rick Bamman - hbamman@shawmedia.com Johnsburg's Nico LoDolce reacts to his first quarter touchdown against Woodstock North on Friday, Sept. 30, 2016. North lost, 56-0. H. Rick Bamman - hbamman@shawmedia.com Johnsburg's Nico LoDolce drags Woodstock defenders Jake Miceli (left) and Joseph Grover along for a first down in the third quarter Friday, Sept. 30, 2016. Johnsburg won, 56-0. 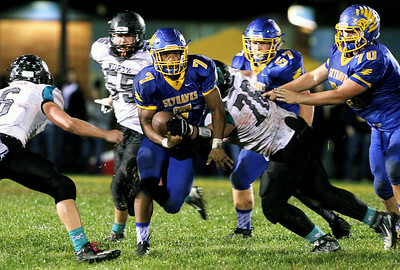 H. Rick Bamman - hbamman@shawmedia.com Johnsburg's Alex Peete bursts through the Woodstock North line Friday, Sept. 30, 2016. 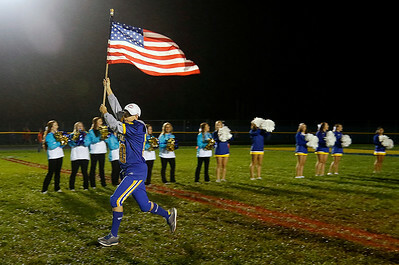 Johnsburg won, 56-0. 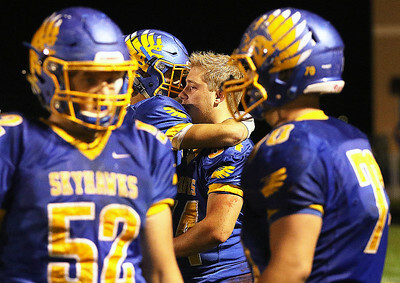 H. Rick Bamman - hbamman@shawmedia.com Johnsburg runing back Bryce Smith is consoled by teammates after he pulled himself out of the game with an ACL injury. H. Rick Bamman - hbamman@shawmedia.com Woodstock North's quarter back Matt Zinnen is sacked by Johnsburg's Jack Kegel in the first quarter Friday, Sept. 30, 2016. JOhnsburg won, 56-0. H. Rick Bamman - hbamman@shawmedia.com Johnsburg's manager Troy Rothschild leads the team onto the field to face Woodstock on Friday, Sept. 30, 2016. H. Rick Bamman - hbamman@shawmedia.com Woodstock North players watch from the sideline as Johnsburg's Alex Peete runs 90 yards for a touch down in the third quarter Friday, Sept. 30, 2016. 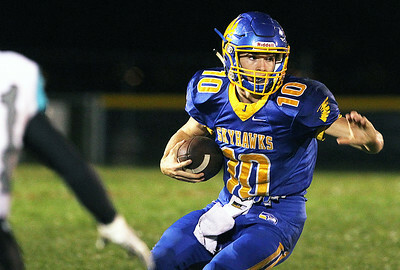 Johnsburg shut out Woodstock North 56-0. H. Rick Bamman - hbamman@shawmedia.com Woodstock North's Lee Thomas heads to the sideline in the second quarter Friday, Sept. 30, 2016. 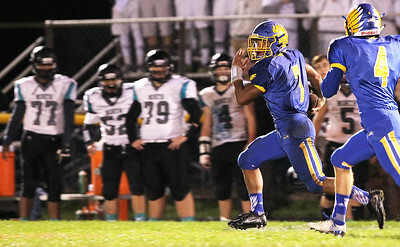 Johnsburg shut out Woodstock North 56-0. H. Rick Bamman - hbamman@shawmedia.com Woodstock North's Matt Zinnen is hurried by Johnsburg's Joe Moore (70) as Austin Butler (25) bats the ball to the ground in the third quarter Friday, Sept. 30, 2016. Johnsburg won, 56-0. 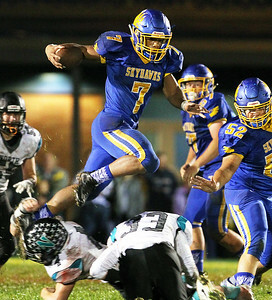 H. Rick Bamman - hbamman@shawmedia.com Johnsburg's running back Alex Peete leaps over Woodstock North defenders Casey Dycus (4) and Jacob Glaves (33) on his way to a first doen in the second quarter Friday, Sept. 30, 2016. 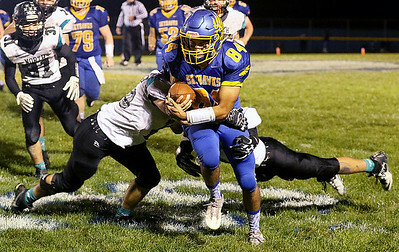 Johnsburg shut out Woodstock North 56-0. Woodstock North's Matt Zinnen is hurried by Johnsburg's Joe Moore (70) as Austin Butler (25) bats the ball to the ground in the third quarter Friday, Sept. 30, 2016. Johnsburg won, 56-0.